Do Kids Count in Cascadia? Things are looking up for Cascadia’s kids. Well some things. According to the Annie E. Casey Foundation’s annual Kids Count Data Book, released yesterday, teen birth rates in the Northwest states have steadily declined since 2000, and regional rates of infant mortality, and child and teen deaths are all down from 1990. But child poverty is up. In the report’s 10 measures of child well-being, Oregon, Idaho, and Washington fared better than average for the country overall, ranking 18th, 16th, and 14th, respectively. Montana slipped to number 34 this year. But for Oregon, Idaho, and Montana, the number of children living in poverty is up from 2000–2003 and is above the national average, perhaps reflecting some of the economic woes the Northwest has seen in recent years. In Oregon, 41 percent of all kids in the state live in low-income families. Oregon and Washington tied at 36th nationally in the percentage of children who live in families in which no parent has full-time, year-round employment. Childhood poverty and parental unemployment can be factors in a host of other problems from lower school performance to higher crime rates and teenage pregnancy. Tracking trends such as child poverty and the teen birthrate--in projects like Kids Count and NEW's Cascadia Scorecard--helps raise awareness of the issues, the first step to creating change. As a next step, the Northwest could make reducing child poverty a major goal for the decade ahead by implementing policies that emphasize personal responsibility while giving working families a way to develop assets that appreciate, not just income (see p. 12 in NEw's report, Population Reprieve). For example, government matching funds for low-income families who save for college or put money away for a down payment on a home. P.S. The incredibly useful Kids Count website lets you compare trends regionally and by year, create charts, and download the raw data. Check it out. In new, single-family houses constructed in the United States, living area per family member has increased by a factor of 3 since the 1950s. This has several environmental implications. Larger houses not only use more building materials, but may also consume proportionally more. Larger houses that include higher ceilings, complex designs such as extra wings, and other features may mean that material use increases proportionally faster than square-footage. And building out has more impacts per square foot than building up because the increased impervious footprint generates more storm water runoff, taxing sewer capacity. Not surprisingly, big houses also require more energy to heat and cool. Good insulation and green building techniques can only do so much for conservation. When the authors calculated heating and cooling costs for a small, poorly insulated house and a well insulated house twice as large, they found the small house still used almost a third less energy. So size really does matter, as Clark has also blogged about. What has caused the trend? Wilson and Boehland cite several factors. Some zoning laws and development covenants mandate minimum house sizes (but some now also mandate maximums). Mortgages for new houses often specify a minimum ratio of house value to land value. And until 1998, tax laws required home sellers to buy a house of equal or greater value unless they wanted to pay capital gains taxes on the appreciated value of their old house. Wilson and Boehland also suggest that the notion of "bigger is better" may be inflating house sizes (see Alan’s post on up-sizing the American dream). But a big house can also be lifeless: quantity without quality. Instead of adding extra rooms, new home builders could invest in the details that give houses their charm (moldings, built in cabinets, granite countertops) and spend more for green details (better insulation, water-saving devices, sustainable materials). They’d save money on energy bills and reduce their environmental impact. Personally, I'd rather spend my home time reading in a bay window seat than cleaning an extra 600 square feet of house. A brief follow-up to Jessica’s urban forests post: urban forests have additional benefits to businesses; however this information is, sadly, not widely known. Other research--in addition to the study by Kathy Wolf that Jessica cited--has found customers were willing to travel farther (hopefully on transit) to reach well-vegetated businesses , and the quality of landscaping along approach routes to business districts has also been found to positively influence consumer perceptions . And a study using a detailed pricing model on existing commercial building rents found a clear relationship between quality landscaping and higher office rental rates; quality landscaping (neat, well-groomed, attractive, able to see the business) increased rental rates by 7 percent, as did good building shade . Businesses also experience increased productivity when their employees are exposed to green spaces: Desk workers who can see nature from their desks take 23 percent less time off sick than those who don’t see any green from their windows, and they also report greater job satisfaction . Expanding on this worker satisfaction trend a bit, social and nature researchers Rachel and Steve Kaplan have a theory (attention restoration theory) that “nearby nature” helps alleviate mental fatigue caused by directed attention-- the fatigue caused by our brains trying to filter too many competing messages. And others are noticing and quantifying the apparent fact that urban greenery has positive social effects as well. Bisco Werner, J.E., Raser, J., Chandler, T.J., and O'Gorman, M. 2002. Trees mean business: a study of the economic impacts of trees and forests in the commercial districts of New York City and New Jersey. New York: Trees New York. 141 pp. Wolf, K.L. 2000. Community Image - Roadside Settings and Public Perceptions, University of Washington College of Forest Resources, Factsheet #32. Laverne, R.J., Winson-Geideman, K. 2003. 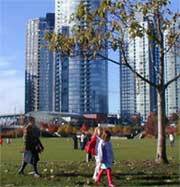 The Influence of Trees and Landscaping on Rental Rates at Office Buildings. Journ. Arbor. 29:5 September 2003 pp. 281-290. Wolf, K.L. 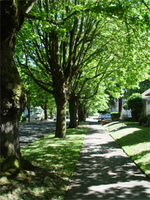 1998 Urban Nature Benefits: Psycho-Social Dimensions of People and Plants, University of Washington College of Forest Resources, Factsheet #1. If you've been following Eric's pieces on sage-grouse, goats, wolves, orcas, salmon, caribou, and other Northwest critters, you may have gathered that NEW is doing research on wildlife in Cascadia--and what it tells us about the health of our natural heritage. In fact, as we described in a Cascadia Scorecard News article this week, NEW is introducing a wildlife index as part of the Cascadia Scorecard project. 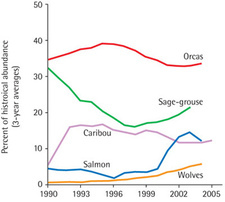 The index tracks population counts of five key indicator species--gray wolves, woodland caribou, greater sage-grouse, orcas, and Chinook salmon--and will be released in complete form in Cascadia Scorecard 2006. As research is completed, we will post articles, maps, and charts from the index both on the wildlife pages of our website and in the wildlife section of our weblog. Gray wolves in Idaho and Montana. Wolves--reintroduced in the mid-1990s--are flourishing and helping to re-balance their native landscapes by, for instance, pressuring the elk herds that formerly browsed on streamside saplings. This, in turn, improves beaver and trout habitat. Woodland caribou of the Selkirk Mountains, a remote region in northeast Washington, northern Idaho, and southern British Columbia. They are the last remaining caribou to visit the continental US and their continued existence hinges on repairing fragmented landscapes, such as forest clearcuts. Greater sage-grouse in Oregon are sensitive to alterations in the vast “sagebrush sea” of the inland Northwest, including ranching, fencing, and invasive species. Chinook salmon returning as adults to the Bonneville Dam, the lowest dam on the Columbia River. These mighty fish are a proxy for the Northwest’s once-prolific salmon runs and for the health of the vast river system that binds British Columbia, Washington, Oregon, and Idaho. Southern resident orcas that inhabit the inland seas of Washington and British Columbia. For much of the last century, these orcas were under siege. Now, although they are still in jeopardy, conservation efforts have paid off. We'd love to hear feedback on the index as we develop it, so please add your comments below. A few weeks back, there was a bit of a stir (see this article for an example) over new US Census Bureau estimates suggesting that, after the urban resurgence of the 1990s, center-city populations in the US were once again on the decline. For someone like me who's convinced of the environmental and social benefits of city living, this didn't seem like good news. Like Denver, Oakland, New York and other big cities, some of the Census Bureau's methods effectively "cheated" Milwaukee out of population gains in the their mid-1990s estimates—and they may be doing the same thing this decade. Now, obviously, I'd like to believe that the Census estimates for urban areas are off-base; but I have no real basis for challenging them. Still, it's worth remembering that estimates are just that -- estimates. So before we get carried away with hype -- one way or the other -- it's worth keeping in mind that even the best estimates, by the best estimators, don't always match up with reality. Urban ecologists are fond of reciting the benefits of trees in the big city: they reduce storm water runoff, absorb pollutants, increase real estate values, and make neighborhoods more attractive. But a recent study (pdf) shows that urban trees may have an unexpected bonus for city shopkeepers: apparently shoppers are willing to pay extra to shop near trees. UW professor Kathleen Wolf showed photos of retail streets with and without trees to inner-city residents across the US and asked how much they would be willing to pay for a variety of items at each location. The study participants perceived shops on treed streets not only as better maintained and having a more pleasant atmosphere but also as likely having higher quality products. These perceptions may translate into more business, because participants also said they were willing to drive farther to those shops (expanding the customer pool) and to pay more for parking. And most important for the bottom line, trees may lead to higher prices: on average, participants said they were willing to pay nearly 12% more to shop on treed streets than on treeless ones. So add happy store owners to the benefits of maintaining trees in the city. While modern cities are a long way from extinction, it's only by acknowledging the primacy of security -- and addressing it in the most aggressive manner -- that they will be able to survive and thrive in this new century, in which they already face the challenge of a telecommunications revolution that is undermining their traditional monopoly on information and culture, and draining their populations. With memories of 9/11 still fresh, perhaps it's natural that people should question whether cities are really safe. Terrorism is, quite obviously, a serious problem; and central cities have proven to be ready targets. Still, I think that the article's emphasis on terrorism per se reveals an interesting and broader cultural bias about risk. There are certain kinds of risks that our culture fears more than others. Some hazards--say, the threat of random violence, whether by ordinary criminals or by terrorists--seem intolerable, and society demands a concerted effort to put a stop to them. Others--say, traffic accidents--we generally shrug off, and accept as part of the unavoidable background of modern life. But sometimes the "unavoidable" risks are far more hazardous, and every bit as avoidable, as the ones on which we focus our attention. At least two peer-reviewed studies (pdfs here and here) have looked at how urban form affects the risk of dying in a vehicle collision. Both studies concluded that people who live in low-density, sprawling neighborhoods face a much greater risk of dying in a car accident than people who live downtown. In New York City, the risk of dying in a collision, either as a pedestrian or a motor vehicle occupant, was only a fourth to a seventh as high as it was for people living in the suburban outskirts of Cleveland, Toledo, Kansas City, or Greensboro, North Carolina. The reason: people who live in sprawling suburbs drive more than people in the urban core, and accident risk is fairly proportional to the distance that people drive. Likewise, combining the risk of collision and crime, counties on the urban fringe were often more dangerous than those at the city center (though older, inner-ring suburbs were often the safest of all). Apparently, the added risk of dying in a car accident in car-dependent, outer-ring suburbs more than counterbalanced the (slightly) elevated risk of dying at the hands of a stranger with a gun in the inner city. Attempts by mayors in these cities to be "hip and cool" have not turned them around, in large part because they are still perceived as unsafe. Baltimore's Mayor Martin O'Malley has cultivated an image of coolness for himself and encouraged other "cool" people, including singles and gays, to add to his city's "creative class." Yet as one Baltimore resident suggested to me recently: "What's the point of being hip and cool if you're dead?" Of course, terrorism may throw a monkey wrench into these sorts of calculations; one serious attack at a city center can more than make up for the risk of dying in a car crash at the outskirts of town. Worse, the risk of a terrorist attack in any given city is quite literally unknowable; it may be quite high, or it could be close to nil. Which makes it very hard to say with any certainty how risky it might be to live in a modern city. But still, it may be that big cities suffer from an image problem: their problem isn't so much actual security as it is perceived security. As a general rule, center cities may, in fact, be fairly safe; but in an era of heightened attention to crime terrorist threats, they may not feel that way. Now, Kotkin's article doesn't claim that the threat of terrorism has, by itself, enticed large numbers of people to flee center cities. Most central city populations have declined in the US and Europe over the past 50 years or so, but many other demographic and cultural forces are at play here. Still, he finds plenty of historical examples in which security threats eventually turned even big cities into ghost towns -- and suggests that the same thing may be happening again. He may, of course, be right. But before you hitch up your wagons and head for the hills, it's worth keeping in mind that -- as appalling as the prospect of crime and terrorism may be -- there are other, less heralded but equally real risks associated with life at the edge of town. So politically, this is a risky move. Which makes it all the more impressive: Vancouver city leaders are actually willing to take concrete and potentially unpopular steps to reduce the city's global warming emissions and promote biking and walking -- steps that seem completely outside the realm of political possibility in, say, Seattle or Portland. Even Seattle mayor Greg Nickels, who has won national recognition for organizing hundreds of the nation's mayors to speak up on global warming, has dedicated considerable political capital to rebuilding the Alaskan Way Viaduct--a massively expensive project that will, in all likelihood, increase the amount of greenhouse gases Seattle residents spew into the atmosphere. Sadly, the city's actions fall short of the rhetoric. "I became a city councillor because of global warming," Bass said after the vote. "And it seems to me that what we have here is a very feasible way of testing out whether we can mobilize people to walk and cycle and for people to leave their cars behind." A new study of flame-retardant chemicals called PBDEs (reported on here) found low relatively levels of the compounds in German breast milk samples -- about 2 parts PBDE per billion parts of milk fat. In contrast, the median level in the Pacific Northwest was about 50 parts per billion, with levels ranging over 300 ppb for a tenth of the samples we analyzed. PBDE concentrations of well over 1,000 parts per billion have been detected in other North American tests. The big difference is that the kinds of PBDEs that are most readily absorbed by living things have mostly been used in the US and Canada. Now, undoubtedly, we'll be living with that mistake for decades. One thing of note in the study: vegetarians had lower levels of contamination than people who ate meat, which is a pattern that hasn't been observed, to my knowledge, in the US or Canada. Typically, fat-soluble contaminants are found at higher concentrations in animal products than in vegetables, grains, and fruits. But it's unclear whether diet is a significant contributor to the high levels of PBDEs found in North America. Some researchers think that ordinary house dust, containing traces of the compounds that have leached from household consumer goods, is the more likely culprit. I found a few interesting oddities in a brand new report (pdf) on commuting from Washington's Office of Financial Management. The survey-based report describes how people in 8 different regions of Washington get to work or school. Not surprisingly, King County does the best overall for alternative forms of commuting. Less than 78 percent of King County residents get to work (or school) by car, truck, or van. And of those, less than 85 percent drive alone. The Tri-Cities region does the worst: more than 92 percent of commuters drive. But when it comes to walking, King County places a distant third. Second place goes to "North Puget"--Island, San Juan, Skagit, and Whatcom Counties--where 5.5 percent of residents commute by foot. But easily the state's leader in walking is the region called "East Balance"--the low-population rural counties of eastern Washington (and not including the counties that house Spokane, Tri-Cities, or Yakima). Nearly 1 in 10 commuters gets to work or school on foot in Washington's cowboy country. My guess is that the relatively high rate of walking in rural eastern Washington is due to the colleges in the region--Central Washington, Eastern Washington, Washington State, and Whitman--where students, faculty, and staff live close enough to campus to walk. If my hunch is right, it would confirm what many urban planners believe: that residential density is a close correlate of alternative transportation. While the vast counties of eastern Washington are generally low density, the academic hubs around colleges and universities tend to be medium- to high-density (and also usually boast a good walker-friendly infrastructure). Walking also appears to be at least mildly correlated to commute time for Washington residents. "East balance" commuters have the shortest commute time--17 minutes--followed by "North Puget" residents with 20 minutes. King County and "Puget Metro" are tied for the longest commute time--27 minutes--while Clark County commuters in the Portland region are runners up at 25 minutes.